I'm including below a list of the titles of all of the ideas submitted to the site. Each one came with more detail and discussion on the site itself, but hopefully this gives you a sense of the kind of ideas that were out there. Thanks to everyone who submitted an idea, voted or commented. I look forward to seeing what new and interesting ways people might use technology tools to explore ideas for community improvement, in Richmond and beyond. A website/link for animal control in a positive way! 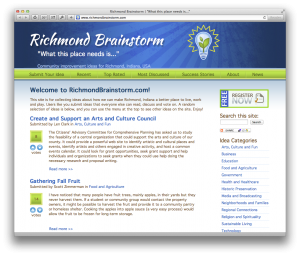 Make Richmond Brainstorm known to the community. Pushing the use of free software and RSS for the pal-item website. Join our Facebook Group "I Love Richmond Indiana"
We must re-establish a manufacturing base in this community.